If you’re suffering from missing teeth or ill-fitting dentures, you understand the impact it can have on your daily quality of life, not to mention your self-esteem. It can be difficult to enjoy your favorite foods, and to speak and smile with confidence. But did you know there may be other things happening under the surface if missing teeth are left missing? Surrounding teeth begin to shift and rotate, compromising your alignment, bite and TMJ. Eventually, the supporting gum tissue and underlying jawbone begin to deteriorate without the support of the tooth root. This can happen even with traditional restorations and dentures that sit on top of the gums. Thankfully, your Austin dentists at Hedgecock Dental can surgically place and restore dental implants right here from the comfort of your dental home! Dental implants are small titanium posts or screws that are surgically inserted into the gums and underlying jawbone. Once healed, dental implants actually fuse to the jawbone and become a fully integrated replacement tooth root, which is an essential component of a healthy, functioning smile. 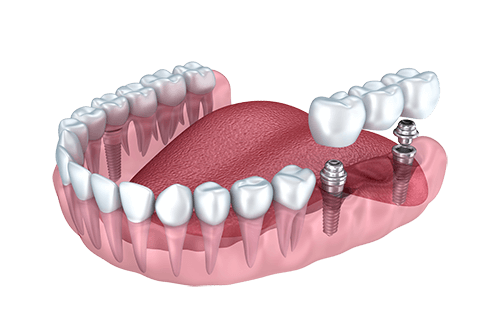 Once healed, dental implants serve as anchors for secured restorations like crowns, bridges or dentures. There are many benefits in deciding to restore your smile with dental implants, ranging from functional benefits, to health benefits, to cosmetic benefits and beyond, and many benefits in choosing our team at Hedgecock Dental for the job. If you are missing most or all of your natural teeth, or living with ill-fitting dentures that rock and slip, we would love to help you regain your confidence in your smile with custom dentures that look, feel and function just like natural teeth.If you are a candidate for dental implants, we highly recommend securing your dentures and your future with implant supported dentures. This is the only way to prevent jawbone deterioration and stimulate new bone growth. Implant dentures help you maintain your facial structure, and allow you the freedom to enjoy your favorite foods and clean and maintain them just like your natural teeth! No more messy denture adhesives or dentures that slip out of place, implant dentures are a secure and permanent solution for patients seeking a better future for their smile. Our advanced cone beam 3D imaging technology allows us to provide precision surgical dental implant placement from the comfort of your dental home. This allows us to see a detailed picture of your jaw bones and other important oral structures including nerves, sinus cavities, and blood vessels, so we know exactly where each implant should go and at what angle to achieve the best results. Once we have created your treatment plan, this advanced technology turns it into a surgical stent or a template to guide your treatment. The surgical stent is used during implant placement to ensure each implant is inserted with precision accuracy and nothing is left to chance. There’s no need to find a dental implant specialist or implantologist—we can complete your entire dental implant treatment comfortably and conveniently under one roof! Worried About the Cost of Treatment? We understand, and we’re here for you. 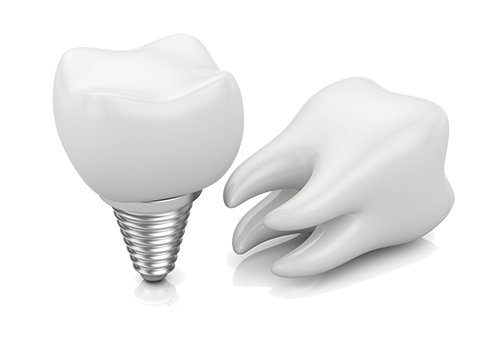 Implants are the highest-recommended tooth replacement solution, and we believe you deserve the best. That’s why we do everything we can to help our patients afford the treatment they need. We’re happy to offer flexible financing options to help you work dental implants into your budget.